Amp! Comics For Kids presents a new full-color all-ages graphic novel written and illustrated by Paige Braddock. “Cecil is a toad. A toad busy doing what any other toad does with its days–judging the pond splashing contest (Reggie the fly is usually the honorary winner by dint of his five-day lifespan), or visiting his friends, Jeff the free-range hamster, Rayray the lizard, Jeremy the worm, or Sprout the frog. And, of course, trying to keep clear of the local hawk. But when Cecil discovers a freeway construction project aimed right at the pond, he knows he has to come up with a plan to save his home. But what can a small group of amphibians and a reincarnating fly do against construction vehicles and a steady onslaught of hot asphalt? Cecil isn’t sure, but he knows they have to try. [This is] the hilarious tale of a group of amphibians (and one free-range hamster) who set out to save their tiny pond home from one very large steamroller. Sometimes big stories happen in small places. Sometimes big things happen to small creatures. 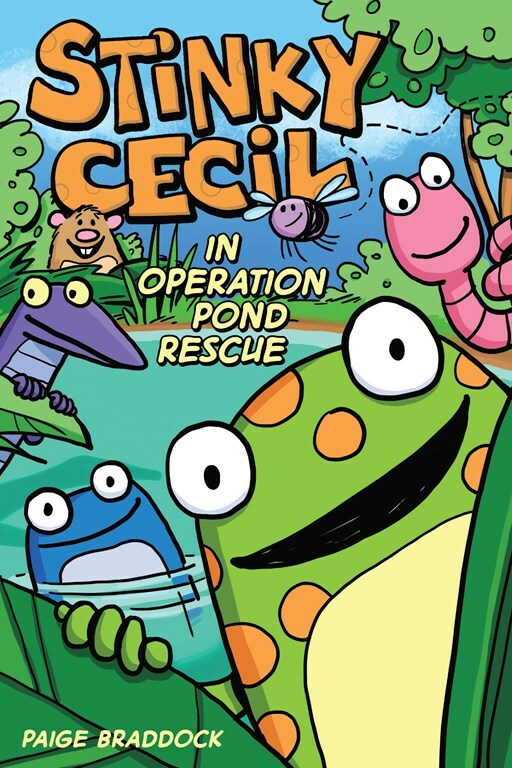 This is one of those stories.” Stinky Cecil in Operation Pond Rescue comes to stores in softcover this February. Find out more at AMP!s big daddy, Andrew’s McMeel Publishing. How much is that dead toad in the window?